Land-based fishing is not only highly addictive, it often produces fantastic fish and you don’t need a whole raft of expensive equipment, or even a boat. So, how does someone get started? 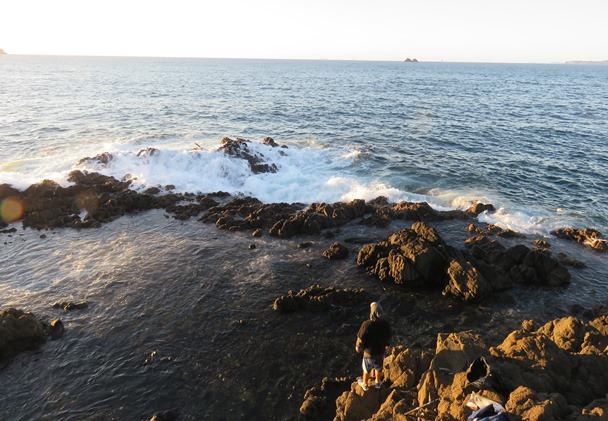 NZ Fishing News contributor Gene Bryant shares the following tips..
For those who have never land-based fished before, the thought of venturing out to find a ledge or kayaking to an isolated rock at sea can be intimidating. However, when you feel ready to venture into the unknown, there a few things that you should know. If there is one thing I cannot stress enough, it is the importance of berley. Use plenty of it and be patient. The aim is to entice fish into your area and get them feeding. Snapper like to hang out with baitfish, so the more you can see the better! Snapper go wild for kina, so if you have access to any, crush them up and throw them in. We are lucky when it comes to land-based fishing in New Zealand: we are surrounded by hundreds upon hundreds of rocky ledges and islands, so the spots are endless. Keep an eye out for kelp beds, kina and mussels, because snapper tend not to stray far from a reliable food source, and these are among their favourites. When selecting your fishing location, the more isolated your spot is the better – accessible locations tend to be overfished. People who have not land-based fished before may underestimate shallow waters and focus solely on locating deep drop-offs. There is a long-standing myth that fishing slows down over the colder months. Winter is an ideal time to target snapper, kahawai, trevally and, occasionally, if you are lucky, a roaming kingfish. Some snapper remain resident around the rocky ledges and kelp beds over the winter while the rest head out to the deep in search of warmer waters. Preparation is key. There is no point walking to your elusive fishing spot for an hour only to be walking home again 30 minutes later because you have run out of tackle. Always ask yourself: am I properly prepared? Make sure your tackle selection includes a good stock of various hooks and sinkers. You never know when you may need a smaller hook to catch fresh baits. A decent knife is a ‘must,’ and it doesn’t hurt to have a rag handy either. Make sure you have plenty of bait – I would much rather walk home with bait than run out while the fish are on the chew. Invest in a decent pack. All land-based fishos know a well-designed pack with well padded straps and a frame will spare you from unnecessary discomfort. Remember, you will be carrying in rods, a gaff and a net – you do not want to be handling multiple loose items. When you think of land-based fishing, it’s unlikely one of your first thoughts will be a lifejacket – unless kayaking to your ledge. You are at just as much risk of drowning as fishermen who use a boat. Be aware of your surroundings – you only need to slip off your ledge to end up in the water. Also, rogue waves are not uncommon, so in addition to storing your gear in an elevated position well away from the water’s edge, have a mental escape plan in place to escape big swells. If unlucky enough to find yourself in the wash, you may well be grateful to be wearing a PFD – it can be like an oceanic washing-machine! These days there are a wide variety of PFDs available that allow you to move freely.